Historically, in healthcare and accessibility contexts, a disability was often regarded as a functional limitation or even 'deficit' in need of overcoming. Consequently, much HCI research in this space has focused on assisting people through tools that address the 'problems' associated with ill-health or disability either by providing access to treatment, or improving the accessibility of certain tasks, and promoting the idea of independent living. In this talk, I take a different orientation to disability that does not regard it as fixed or determined alone in, or through, the body. Instead, I consider a person's (dis)ability as created through interactions within their environment. For technology design, this suggests a shift in focus from mostly pragmatic considerations of promoting access, accessibility, and personal change, towards a more holistic view on how people negotiate their own abilities in different situations. Drawing on findings of two recent studies that involved people with vision impairments, I will show how situated negotiations of ability present fluid, continuous processes that are often accomplished with, and through, other people; how ability is bound up with interpersonal relationships and social experiences; and how technology can play an important part in assisting in negotiations of ability, and thereby serve to extend peoples' capabilities. 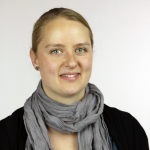 Anja Thieme is a Researcher in the Human Experience & Design (HXD) group at Microsoft Research Cambridge, UK. She creates and studies technological innovations that extend people's abilities and enhance their social and emotional experiences. In recent years she has predominantly applied this expertise in the domains of healthcare, accessibility, and AI-enabled technology. Her research and projects are user-centric and often underpinned by collaborations with researchers and practitioners from a diverse range of disciplines including design, social science, education, healthcare, machine learning, computer vision, and engineering. Prior to her position at Microsoft, she was a Research Associate in the Digital Interaction Group (DIG) at Newcastle University's Culture Lab. She completed a PhD in Computing Science from Newcastle University in 2015, investigating the role of technology in supporting people's mental health and wellbeing.